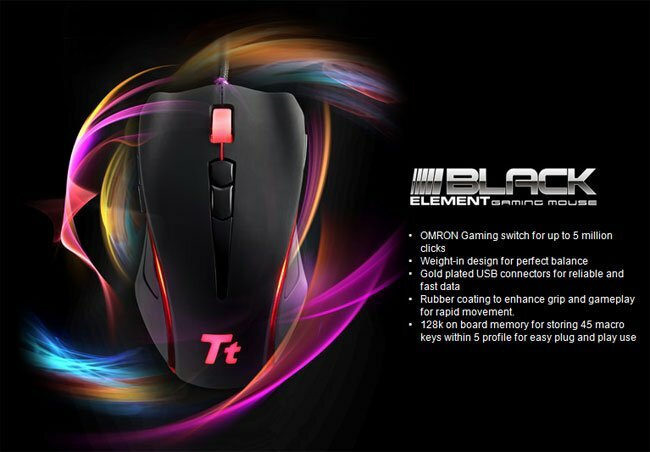 Tt eSports has unveiled a new gaming mouse alled the Black Element that is made specifically for the gamer that enjoys RTS or MMORPG games. The mouse is a laser gaming mouse with 6500dpi sensitivity. It has a special Omron Gaming switch that is good for 5 million presses. The mouse is weighted for comfort and has gold plated USB connectors. The outside of the mouse is coated in a rubberized finish for better grip. The colors of the lights can be tweaked with five color options to suit your style. The thing that makes it aimed at MMO and RTS gamers is that the mouse and 128kb of onboard memory for storing macros and profiles. Pricing and availability are unknown at this time.